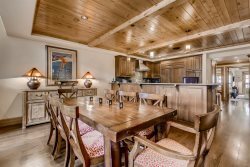 3 bedroom 3.5 bath condominium is tucked at the base of the slopes and in the heart of Vail offering gorgeous mountain views. Just a short walk to the ski lifts, shops, restaurants and The Ford Amphitheatre. Hotel-style amenities but with a cozy and unique mountain feel of a private residence. High end finishes are what make this condo comfortable and the perfect spot for your Vail vacation. Bedding is includes 2 bedrooms with King beds and a third bedroom with 2 twin bunk beds.